The oral cavity is the site of much infectious and inflammatory disease which has been associated with systemic diseases such as diabetes, cardiovascular disease and pre-term low births. This article emphasizes on the oral-systemic disease connection which is now a rapidly advancing area of research. The possible systemic diseases which arise from oral microorganisms are hereby focused. In addition, conditions such as diabetes have been shown to increase the risk of periodontal disease. Conversely periodontal therapy may improve the diabetic condition by stabilizing the systemic blood sugar levels. Bacteria from the periodontal infection enter the blood and invade heart and blood vessel tissue causing harmful effects. The body responds to the periodontal infection with the production of inflammatory mediators that travel through the blood and cause harmful effects on the heart and blood vessels. Bacteria from a mother's mouth can be transmitted through the blood and amniotic fluid in the womb to her unborn child. This could contribute to the risk of a premature delivery, a low birth weight baby, premature onset of contractions, or infection of the newborn child. There have been a very large number of studies conducted to test the validity of the relationships, for example, between periodontal destruction and prevalence of myocardial infarction and stroke. While some research centres in the USA, South America and Germany have shown increased risks for stroke of up to four-fold, other research groups can find no relationship. Here we need to emphasize that the investigation into oral-systemic disease connections is a rapidly advancing area of research, and that new information is constantly appearing in the literature. Further studies on periodontal infections and systemic inflammation as a cause or as an exacerbating factor for the progression of cardiovascular diseases, metastasis from primary tumors in the oral cavity and if there is a link of immunological diseases is needed. Increase in inter-professional collaboration and communication between dental hygienists and other health professionals is the need of the hour. We need to emphasize that the investigation into oral-systemic disease connections is a rapidly advancing area of research, and that the early identification of oral disease may contribute to the early diagnosis and treatment for a number of systemic diseases. A need for additional knowledge is required to link the inter-relationships between dentistry and medicine to further improve the management of overall health of patients which will further strengthen the partnership between dental and medical communities. 1. 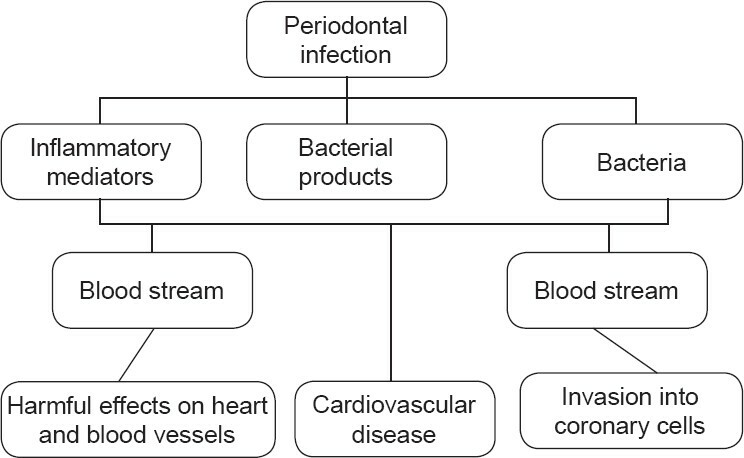 Overview of the links between oral and systemic health with emphasis on periodontal and cardiovascular disease. North America: ILSI; Jan1 Beck JD, Garcia R, Heiss G, Vokonas PS, Offenbacher S. Periodontal disease and cardiovascular disease. J Periodontol 1996;67(Suppl 10):1123-37. 2. Glogauer M, McCulloch CA. An overview: Introduction to the RCDSO Symposium-Oral Health: A window to systemic disease. Supplement to RCDSO dispatch Spring Jan 2005. 3. Heasman PA, Lauffart BL, Preshaw PM. Crevicular fluid prostaglandin EZ levels in periodontitis- resistant and periodontitis susceptible adults. J Clin Periodontol 1998;25:1003-7. 4. Pai JK, Pischon T, Ma J, Manson JE, Hankinson SE, Joshipura, et al. Inflammatory markers and the risk of coronary heart disease in men and women. N Engl J Med 2004;351:2599-610. 5. Li X, Kolltveit KM, Tronstad L, Olsen I. Systemic diseases caused by oral infection. Clin Microbiol Rev 2000;13:547-58. 6. Thoden van Velzen SK, Abraham-Inpijn L, Moorer WR. Plaque and systemic disease: A reappraisal of the focal infection concept. J Clin Periodontol 1984;11:209-20. 7. Okuda K, Ebihara Y. Relationships between chronic oral infectious diseases and systemic diseases. Bull Tokyo Dent Coll 1998;39:165-74. 8. Rams TE, Slots J. 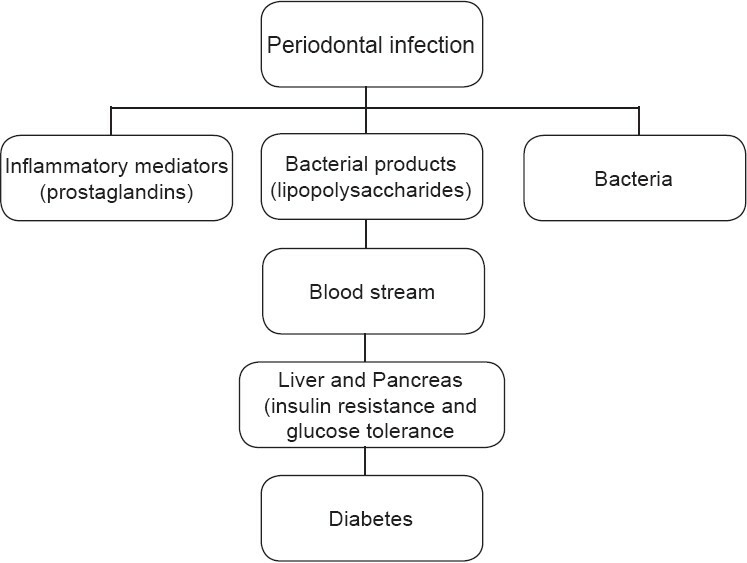 Systemic manifestations of oral infections. In: Slots J, Taubman MA, editors. Contemporary oral microbiology and immunology. Mosby: St. Louis, Mo; 1992. p. 500-23. 9. Soory M. Periodontal disease severity and systemic diseases prevalent in a Caribbean area of patients. West Indian Med J 2007;56:190-3. 10. Lux J. Review of the oral disease- Systemic Disease Link Part I: Heart Disease, Diabetes. Can J Den Hyg 2006;40:288-342. 11. Rodrigues and Progulska Fox Sept 30, First gene profile of oral pathogen as it invades coronary artery. U.S.: NIDCR; 2005. 12. Hahn, Schenkein, Tew. Aug 12, Important clue in how certain oral bacteria might contribute to heart condition. U.S.: NIDCR. 2005. 13. Kuska B. Study finds direct association between cardiovascular disease and periodontal bacteria. U.S.: NIDCR 2005;301:594. 14. Slade GD, Offenbacher S, Bexk JD, Heiss G, Pankow JS. Acute- phase inflammatory response to periodontal disease in the U. S population. J Dent Res 2000;79:49-57. 15. Kiran M, Arpak N, Unsal E, Erdogan MF. The effect of improved periodontal health on metabolic control in type 2 diabetes mellitus. J Clin Periodontol 2005;32:266-72. 16. Offenbacher S, Beck JD, Lieff S, Slade G. Role of periodontitis in systemic health: spontaneous preterm birth. J Dent Educ 1998;62:852-8. 17. Hillier SL, Martius J, Krohn M, Kiviat N, Holmes KK, Eschenbach DA. A case- control study of chorioaminonic infection and histologic chorioamionitis in prematurity. N Engl J Med 1988;319:972-8. 18. Jeffcoat MK, Geurs NC, Reddy MS, Goldenberg RL, Hauth JC. Current evidence regarding periodontal disease as a risk factor in preterm birth. Ann Periodontol 2001;6:183-8. 19. Gonzales-Marin C; Collegues, Queen Mary University. Body and Soul. India: Times of India; 18 Apr 2009. 20. Lux J. Canadian dental hygienists association. Canadian dental hygienists association position statements. Canadian J Dent Hyg 2006;40:288-342. 21. Limeback H. Implications of oral infections on systemic diseases in the institutionalized elderly with special focus on pneumonia. Ann Periodontol 1998;3:262-75. 22. Goultschin J, Attal U, Goldstein M, Boyan BD, Schwartz Z. The relationship between peripheral levels of leukocytes and neutrophils and periodontal disease status in a patient with congenital neutropenia. J Periodontol 2000;71:1499-505. 23. Loe H, Silness J. Periodontal disease in pregnancy: Prevalence and severity. Acta Odontol Scand 1963;21:532-51. Norwood Jr., K.W. and Slayton, R.L.